Please reply if you download this! 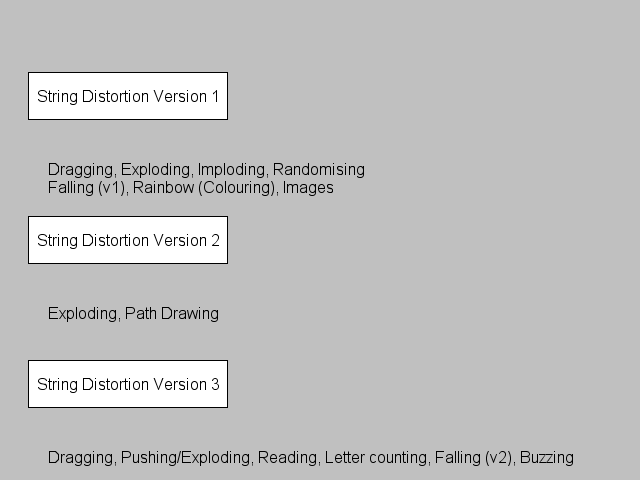 This example shows an interesting effect that I've named "string distortion". Basically, it splits up a string into separate characters, which are then able to be manipulated individually. This allows for some weird and wonderful effects. Try them out! I've compiled the three versions into one file, so you can see all the different effects without having to download each version separately. It's very simple to use. Click on which version you'd like to see and press Escape to go back to the menu. Each example tells you what controls you can use. I was reminded of a game that has these really cool credits. As the credits came down, you could create a sort of circle of distortion that all the letters in the credits would be pushed away from. I decided this would look nice in one of my games, so I went about making a system that was capable of doing things like that. The basic idea is that a string, for example "Hello world" is split up into separate letters - "H", "e", "l" etc. Each letter has an x and a y variable as well as an xstart and ystart. An array is created to hold the information of all these letters. Then, with a few lines of code, you can move around separate letters in a string at will. This example contains the scripts for separating a string, as well as drawing it. It also contains scripts for getting and setting variables for each letter, so creating effects of your own is not too difficult. I quickly made a highlighting feature, so you can see which letter the mouse is over. Then, by pressing Up or Down you can explode or implode the text around the cursor. Because each letter has 5 variables, it can get quite slow if you have a long string, so try to keep the string sizes not too big. If you decide to use this in your own game, please credit Dark Matter. Report any glitches you find to me too. Edited by Dark Matter, 06 August 2011 - 11:56 AM. that is a VERY nice idea however it is quite basic..... but well done making this in your spare time. you said it could be used for credits, could u make a credit schrolling function on it??? in the step event. This will move all the text down, and you can distort it while it's scrolling. congrats on a great example. @Kolink - actually, that's just the game I was thinking of when I created this example Although credits is probably the most obvious thing this can be used for, it could just as easily be used to do things like make the letters fly from all directions, spelling out the title or options or something. I have tried to make it very versitile, so it can be used in a wide range of ways. @Newly discovered - thanks! Using objects would be a very slow an in-efficient way of doing it. I've tried to make it as efficient as I can, so it can be used in games without reducing the fps too much. love the example it's brilliant. Thanks! Feel free to say anything you think should be added or adjusted to the example. 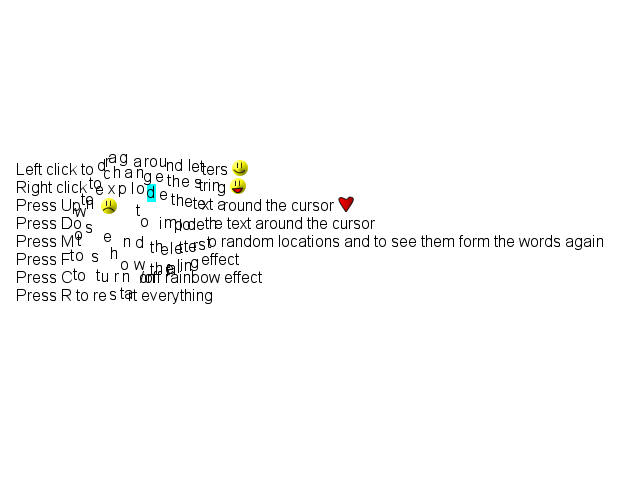 Also, try out the smilies ( =) =( =P =D <3 o_O O_o o.O O.o >.< >_< ) Just type those into the string, and they'll appear as smilies, which can be pushed around just like the letters. I´m reminded of the "Instance Based Text" example that is on these forums (and that I used extensively in my game Minimal) and the moment I can, I will find a use for this too!!! Thanks for the comment. The scripts were basically there because, in my opinion, they are easier to read in the code - I'm not sure if other people find this or not They can be deleted and as long as the code for the few times they are used is changed, it won't make any impact. I hadn't seen the Instance Based Text before, but now having looked at it, yes - the idea is similar, but the way it's done it quite different. This is very good. A means to blast the letters and send them bouncing around the screen would be great! Should I give credit if I use this in one of my games? Edited by skulldragon, 06 February 2010 - 02:41 PM. Support The War Effort! Sign Up To The Warfare Game Series Website And The Wiki Today! Oh, you said to. Sorry, missed it at first. If you decide to use this in your own game, please credit Dark Matter. woah i had an account here??? but what's the point of all this dm? Really, it's just a fancy effect. You could maybe use it so the credits aren't so boring, or you could make words be created letter by letter. It just gives a nice touch to a game. @Supersniper: It´s in the details... a great game has little details that round out the product, and this could be just one of them!!!! I've just updated the example! Now, there's 2 extra effects - and the option to restart everything. When you press M, the letters get sent to random locations, and then move back towards their original places. Pressing F will make letters fall out of the string, letter by letter. I created both these effects in around 5 minutes, which shows just how quick and easy it is to make new effects. Great idea. Very nice effect. Thanks for your work! This example contains the scripts for separating a string, as well as drawing it. It also contains scripts for getting and setting variables for each letter, so creating effects of your own is too difficult. Shouldn't that say not too difficult? It really is not difficult to make your own effects. If you download this, please leave a comment. I'd love to hear your feedback and I'd be happy to make any improvements you think this example would benefit from. It'd also be great if you came up with some effects of your own and shared them. Is no-one going to reply? I'm getting downloads, but no replies. If you download this, please leave a reply! Thanks! I've just added a new version! This includes individual letter colours. I've added an example that makes a rainbow flash through the text - try it out and tell me what you think! Any other comments, effects you think would be good, or anything you've made with this would be great! Edited by Dark Matter, 13 May 2010 - 05:38 PM. I re-wrote this a while back, using ds_lists instead of arrays. In the tests I did, it was 300% faster than the previous version. It includes moving letters (like before) and also drawing a path for the letters to follow (a new feature, trying to copy the text on path tool in Adobe Illustrator). Excellent! The new path feature is great. So is the superior efficiency. This is a great, innovative and pretty unique example. I love this effect and so it's been moved to Staff Pick. Glad you think it's cool too. I actually have a later version of this, which is even faster. If anyone wants to see if, I'd be happy to upload it, but I'll wait for more feedback before I do. Please let me know if you're using this! Yeah this is a cool example, I can see it being used to make text entering a room more interesting- the letters all flying back into place is nice for this! Okay, so here's my improved version I said I would upload. It's slightly different and doesn't have quite as many features, but it has some rather cool ones. Press E to make the letters buzz. The further down your mouse is, the more they buzz. Put the mouse on the left to make them buzz with no rotation and on the right to have rotation. Press F to make each letter fall one by one. I don't see very many uses for this, but it certainly is fun to play around with. It's pretty cool! Yeah, use is the one thing I'm lacking. It can be used for cool effects for credits or "magic text" in cutscenes and things like that, but not much. Feel free to offer suggestions! I've updated the main post, which now contains a gmk and exe containing all 3 versions, which should make it easier to see the different effects each one contains. Each new version is faster than the last. I've also fixed a few glitches in them (such as images not appearing in the first example). Whoa very nicely done! It's one of those things you don't really look for, but once you find it you can't imagine why you didn't look for it earlier lol. I am definitely using this in my next project! The only issue I have is that you don't have the code stored in scripts. If you did that, users could call an explode script for example and set the explosion distance which would make a really cool "firecracker" effect, where different words explode in different sizes. This will give the user a lot more control, that way I could pass the mouse_x/mouse_y positions to mx/my OR the position of an object...this would allow you to have a ball bouncing around the screen pushing the letters on its own for instance. Really though, this is an awesome set of examples! The only issue I have is that you don't have the code stored in scripts. If you did that, users could call an explode script for example and set the explosion distance which would make a really cool "firecracker" effect, where different words explode in different sizes. Yeah, that's a good idea. I may add it in if I get some free time. Well, it's nice to see it getting some attention, but what did you actually think of the system? The angle distortion destroyes the quality of the writing, possibly having the user have to drop this way of having text angle. Though I didn't yet test it in Studio which has a new way of angle drawing. Calculating the distance between letters so they won't 'touch' which might give a more attractive effect! Do the same for sprites etc. 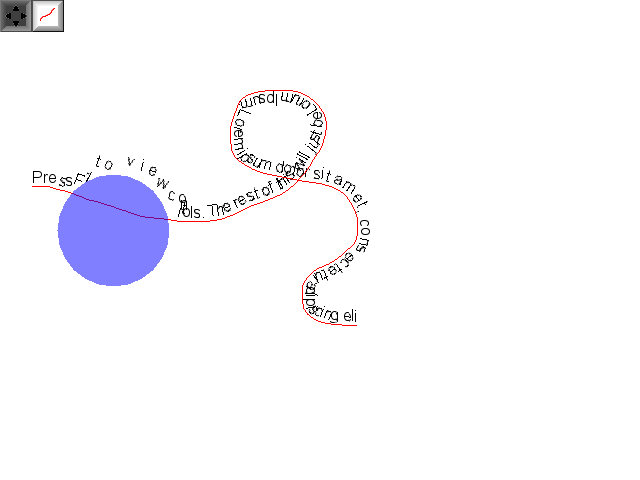 For example a user may want to have a wave animation of self drawn non-font-able letters. Just had this brilljant idea for maybe have the text move over the line: imagine it going from the left to the right over the line. Like a train. care about the code itself (like me). Even an example needs to be a little atractive if most people want to appreciate it, for some did not develope enough imagination to see bigger potential. use this in my game in a slightly different way and can not reach that desired effect. Edited by Ruub, 10 December 2012 - 11:09 AM. 1. 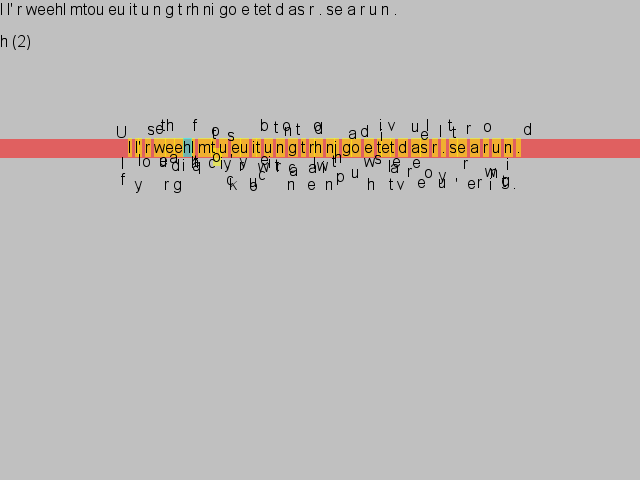 Yes, that's entirely down to GM's rotated text rendering system. I haven't tried it in Studio either - I'm not sure how it fares. 2. That's a possibility, although automatic kerning adjustment may make it look a little odd. One would have to play around with it and see. 3. Yeah, that's definitely a feature that could be added in the future, if I was still working on it. I don't think it'd be too hard to add yourself if you wanted. 4. You mean like <marquee>? What functional use could that possible have? 5. I could definitely write a couple of examples, but I can't think of many other uses for it other than special effects. If you have any ideas, do suggest them. 6. Yes, this system was based quite heavily off the fact that to achieve other effects users could program them in themselves - once you understand GML quite well, it's quite simply written, but it is an issue for more intermediate users. If I ever feel like working on this again, I'll try to come up with a more simplified system for working with the characters.